John Butcher and Phil Minton are two regulars, two internationally celebrated greats of the London free music scene. Both have their roots in jazz-Phil Minton as a singer and trumpeter, strongly inspired by Chet Baker and John Butcher as a saxophone player in the Cool Jazz tradition. When looking back on this long history, one clearly sees how much both have swum freely. Today they have at their disposal an unmistakable, equally idiosyncratic as well as hyper-precise expression. Minton, who has given up playing the trumpet, has developed his singing style such that it encompasses all the possible articulations of a singer, from pure noise explosions to a respectfully performed worker's song, thereby not returning to any prescribed style. Phil Minton constantly sings ... Phil Minton. This does not found any sort of complacency, rather a sincere radical nature. John Butcher has completely absorbed his influences, if that's what they were, into his playing. Wayne Marsh, Steven Lacy, Evan Parker-these masters may have played an important role for his playing, but in his very dry articulation, knife-sharp sound research as well as in the phrasing from (atonal) melodies, Butcher sounds only like ... Butcher. 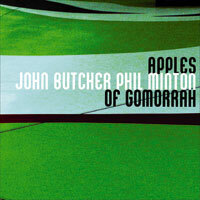 As soloists (Phil Minton has two, Butcher three solo records) as well as players in demand (Minton among others with Peter Brötzmann, Four Walls, Tom Cora, Fred Frith, Bob Ostertag, Franz Koglmann, Bill Dixon and Pat Thomas; John Butcher among others. with Phil Durrant, John Russell, Derek Bailey, Polwechsel, Georg Graewe and Chris Burn), they have been around for over 20 years. Together they play in a trio with the guitarist from Münster, Germany, Erhard Hirt and in Minton's Quartet (with Veryan Weston and Roger Turner), a group that, i.a. has worked through James Joyce's Finnegans Wake. A duet of both seems so obvious that the only critical question about this cooperation is why it hadn't happened sooner. These recordings took place over a period of several years and were post-produced and mastered over a long space of time. There are mostly short improvisations to be heard, 17 pieces in a little more than 40 minutes, which are, however, so densely cut and arranged, that a extremely tense arc results in the length of the CD. They have distilled the ideal concert for this CD from their long years of duo work together. Both sink so much in the music of the other that the duo sound leads to a maximal density. At the same time, it rips them apart again-at every moment the difference between Butcher's saxophone sound and Minton's voice becomes conscious. Which means: this meeting does not leave the playing of one untouched by the other.